Bret Stephens writes the foreign-affairs column of the Wall Street Journal, for which he won the 2013 Pulitzer Prize for commentary. 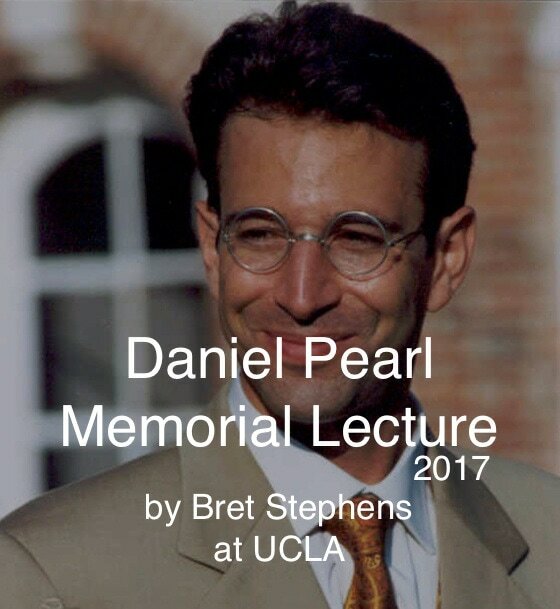 I’m profoundly honored to have this opportunity to celebrate the legacy of Danny Pearl, my colleague at The Wall Street Journal. My topic this evening is intellectual integrity in the age of Donald Trump. I suspect this is a theme that would have resonated with Danny. Not probably factual. Not partially factual. Not alternatively factual. I mean fundamentally, comprehensively and exclusively factual. And therefore trustworthy. This is how we operate. This is how Danny operated. This is how he died, losing his life in an effort to nail down a story. In the 15 years since Danny’s death, the list of murdered journalists has grown long. Paul Klebnikov and Anna Politkovskaya in Russia. Zahra Kazemi and Sattar Behesti in Iran. Jim Foley and Steve Sotloff in Syria. Five journalists in Turkey. Twenty-six in Mexico. More than 100 in Iraq. When we honor Danny, we honor them, too. Some of you may have noticed that we’re living through a period in which the executive branch of government is engaged in a systematic effort to create a climate of opinion against the news business. The President routinely describes reporting he dislikes as FAKE NEWS. The Administration calls the press “the opposition party,” ridicules news organizations it doesn’t like as business failures, and calls for journalists to be fired. Mr. Trump has called for rewriting libel laws in order to more easily sue the press. This isn’t unprecedented in U.S. history, though you might have to go back to the Administration of John Adams to see something quite like it. And so far the rhetorical salvos haven’t been matched by legal or regulatory action. Maybe they never will be. But the question of what Mr. Trump might yet do by political methods against the media matters a great deal less than what he is attempting to do by ideological and philosophical methods. Ideologically, the president is trying to depose so-called mainstream media in favor of the media he likes — Breitbart News and the rest. Another way of making this point is to say that he’s trying to substitute news for propaganda, information for boosterism. Is there any validity to the criticism of you that you say things that you can’t back up factually, and as the President you say there are three million illegal aliens who voted and you don’t have the data to back that up, some people are going to say that it’s irresponsible for the President to say that. Many people have come out and said I’m right. I think it’s important not to dismiss the president’s reply simply as dumb. We ought to assume that it’s darkly brilliant — if not in intention than certainly in effect. The president is responding to a claim of fact not by denying the fact, but by denying the claim that facts are supposed to have on an argument. Substitute the words “truth” and “falsehood” for “justice” and “injustice,” and there you have the Trumpian view of the world. If I had to sum it up in a single sentence, it would be this: Truth is what you can get away with. If you can sell condos by claiming your building is 90% occupied when it’s only 20% occupied, well, then—it’s 90% occupied. If you can convince a sufficient number of people that you really did win the popular vote, or that your inauguration crowds were the biggest—well then, what do the statistical data and aerial photographs matter? Now, we could have some interesting conversations about why this is happening—and why it seems to be happening all of a sudden. The interesting conversation concerns how we come to accept those lies. Nearly 25 years ago, Daniel Patrick Moynihan, the great scholar and Democratic Senator from New York, coined the phrase, “defining deviancy down.” His topic at the time was crime, and how American society had come to accept ever-increasing rates of violent crime as normal. “We have been re-defining deviancy so as to exempt much conduct previously stigmatized, and also quietly raising the ‘normal’ level in categories where behavior is now abnormal by any earlier standard,” Moynihan wrote. You can point to all sorts of ways in which this redefinition of deviancy has also been the story of our politics over the past 30 years, a story with a fully bipartisan set of villains. I personally think we crossed a rubicon in the Clinton years, when three things happened: we decided that some types of presidential lies didn’t matter; we concluded that “character” was an over-rated consideration when it came to judging a president; and we allowed the lines between political culture and celebrity culture to become hopelessly blurred. But whatever else one might say about President Clinton, what we have now is the crack-cocaine version of that. If a public figure tells a whopping lie once in his life, it’ll haunt him into his grave. If he lies morning, noon and night, it will become almost impossible to remember any one particular lie. Outrage will fall victim to its own ubiquity. It’s the same truth contained in Stalin’s famous remark that the death of one man is a tragedy but the death of a million is a statistic. One of the most interesting phenomena during the presidential campaign was waiting for Trump to say that one thing that would surely break the back of his candidacy. Would it be his slander against Mexican immigrants? Or his slur about John McCain’s record as a POW? Or his lie about New Jersey Muslims celebrating 9/11? Or his attacks on Megyn Kelly, on a disabled New York Times reporter, on a Mexican-American judge? Would it be him tweeting quotations from Benito Mussolini, or his sly overtures to David Duke and the alt-right? Would it be his unwavering praise of Vladimir Putin? Would it be his refusal to release his tax returns, or the sham that seems to (have) been perpetrated on the saps who signed up for his Trump U courses? Would it be the tape of him with Billy Bush? None of this made the slightest difference. On the contrary, it helped him. Some people became desensitized by the never-ending assaults on what was once quaintly known as “human decency.” Others seemed to positively admire the comments as refreshing examples of personal authenticity and political incorrectness. Shameless rhetoric will always find a receptive audience with shameless people. Donald Trump’s was the greatest political strip-tease act in U.S. political history: the dirtier he got, the more skin he showed, the more his core supporters liked it. Here’s a simple truth about a politics of dishonesty, insult and scandal: It’s entertaining. Politics as we’ve had it for most of my life has, with just a few exceptions, been distant and dull. Now it’s all we can talk about. If you like Trump, his presence in the White House is a daily extravaganza of sticking it to pompous elites and querulous reporters. If you hate Trump, you wake up every day with some fresh outrage to turn over in your head and text your friends about. Whichever way, it’s exhilarating. Haven’t all of us noticed that everything feels speeded up, more vivid, more intense and consequential? One of the benefits of an alternative-facts administration is that fiction can take you anywhere. Earlier today, at his press conference, the president claimed his administration is running like a “fine-tuned machine.” In actual fact, he just lost his Labor Secretary nominee, his National Security Adviser was forced out in disgrace, and the Intelligence Community is refusing to fully brief the president for fear he might compromise sources and methods. But who cares? Since when in Washington has there been a presidential press conference like that? Since when has the denial of reality been taken to such a bald-faced extreme? At some point, it becomes increasingly easy for people to mistake the reality of the performance for reality itself. If Trump can get through a press conference like that without showing a hint of embarrassment, remorse or misgiving—well, then, that becomes a new basis on which the president can now be judged. To tell a lie is wrong. But to tell a lie with brass takes skill. Ultimately, Trump’s press conference will be judged not on some kind of Olympic point system, but on whether he “won”—which is to say, whether he brazened his way through it. And the answer to that is almost certainly yes. So far, I’ve offered you three ideas about how it is that we have come to accept the president’s behavior. The first is that we normalize it, simply by becoming inured to constant repetition of the same bad behavior. The second is that at some level it excites and entertains us. By putting aside our usual moral filters—the ones that tell us that truth matters, that upright conduct matters, that things ought to be done in a certain way—we have been given tickets to a spectacle, in which all you want to do is watch. And the third is that we adopt new metrics of judgment, in which politics becomes more about perceptions than performance—of how a given action is perceived as being perceived. If a reporter for the New York Times says that Trump’s press conference probably plays well in Peoria, then that increases the chances that it will play well in Peoria. Let me add a fourth point here: our tendency to rationalize. One of the more fascinating aspects of last year’s presidential campaign was the rise of a class of pundits I call the “TrumpXplainers.” For instance, Trump would give a speech or offer an answer in a debate that amounted to little more than a word jumble. But rather than quote Trump, or point out that what he had said was grammatically and logically nonsensical, the TrumpXplainers would tell us what he had allegedly meant to say. They became our political semioticians, ascribing pattern and meaning to the rune-stones of Trump’s mind. If Trump said he’d get Mexico to pay for his wall, you could count on someone to provide a complex tariff scheme to make good on the promise. If Trump said that we should not have gone into Iraq but that, once there, we should have “taken the oil,” we’d have a similarly high-flown explanation as to how we could engineer this theft. A year ago, when he was trying to explain his idea of a foreign policy to the New York Times’s David Sanger, the reporter asked him whether it didn’t amount to a kind of “America First policy”—a reference to the isolationist and anti-Semitic America First Committee that tried to prevent U.S. entry into World War II. Trump clearly had never heard of the group, but he liked the phrase and made it his own. And that’s how we got the return of America First. 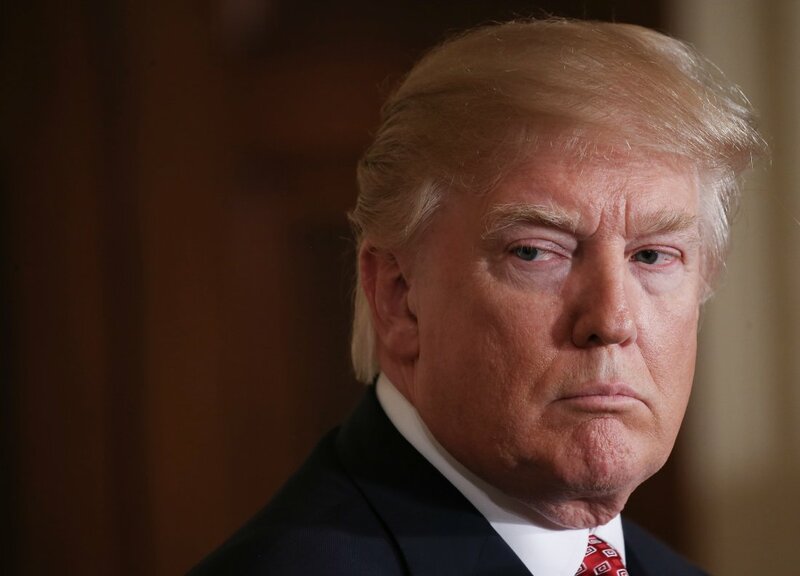 More recently, I came across this headline in the conservative Washington Times: “How Trump’s ‘disarray’ may be merely a strategy,” by Wesley Pruden, the paper’s former editor-in-chief. In his view, the president’s first disastrous month in office is, in fact, evidence of a refreshing openness to dissent, reminiscent of Washington and Lincoln’s cabinet of rivals. Sure. Overall, the process is one in which explanation becomes rationalization, which in turn becomes justification. Trump says X. What he really means is Y. And while you might not like it, he’s giving voice to the angers and anxieties of Z. Who, by the way, you’re not allowed to question or criticize, because anxiety and anger are their own justifications these days. Watching this process unfold has been particularly painful for me as a conservative columnist. I find myself in the awkward position of having recently become popular among some of my liberal peers—precisely because I haven’t changed my opinions about anything. By contrast, I’ve become suddenly unpopular among some of my former fans on the right—again, because I’ve stuck to my views. It is almost amusing to be accused of suffering from something called “Trump Derangement Syndrome” simply because I feel an obligation to raise my voice against, say, the president suggesting a moral equivalency between the U.S. and Vladimir Putin’s Russia. The most painful aspect of this has been to watch people I previously considered thoughtful and principled conservatives give themselves over to a species of illiberal politics from which I once thought they were immune. In his 1953 masterpiece, “The Captive Mind,” the Polish poet and dissident Czeslaw Milosz analyzed the psychological and intellectual pathways through which some of his former colleagues in Poland’s post-war Communist regime allowed themselves to be converted into ardent Stalinists. In none of the cases that Milosz analyzed was coercion the main reason for the conversion. They wanted to believe. They were willing to adapt. They thought they could do more good from the inside. They convinced themselves that their former principles didn’t fit with the march of history, or that to hold fast to one’s beliefs was a sign of priggishness and pig-headedness. They felt that to reject the new order of things was to relegate themselves to irrelevance and oblivion. They mocked their former friends who refused to join the new order as morally vain reactionaries. They convinced themselves that, brutal and capricious as Stalinism might be, it couldn’t possibly be worse than the exploitative capitalism of the West. I fear we are witnessing a similar process unfold among many conservative intellectuals on the right. It has been stunning to watch a movement that once believed in the benefits of free trade and free enterprise merrily give itself over to a champion of protectionism whose economic instincts recall the corporatism of 1930s Italy or 1950s Argentina. It is no less stunning to watch people who once mocked Obama for being too soft on Russia suddenly discover the virtues of Trump’s “pragmatism” on the subject. And it is nothing short of amazing to watch the party of onetime moral majoritarians, who spent a decade fulminating about Bill Clinton’s sexual habits, suddenly find complete comfort with the idea that character and temperament are irrelevant qualifications for high office. The mental pathways by which the new Trumpian conservatives have made their peace with their new political master aren’t so different from Milosz’s former colleagues. There’s the same desperate desire for political influence; the same belief that Trump represents a historical force to which they ought to belong; the same willingness to bend or discard principles they once considered sacred; the same fear of seeming out-of-touch with the mood of the public; the same tendency to look the other way at comments or actions that they cannot possibly justify; the same belief that you do more good by joining than by opposing; the same Manichean belief that, if Hillary Clinton had been elected, the United States would have all-but ended as a country. This is supposed to be the road of pragmatism, of turning lemons into lemonade. I would counter that it’s the road of ignominy, of hitching a ride with a drunk driver. So, then, to the subject that brings me here today: Maintaining intellectual integrity in the age of Trump. When Judea wrote me last summer to ask if I’d be this year’s speaker, I got my copy of Danny’s collected writings, “At Home in the World,” and began to read him all over again. It brought back to me the fact that, the reason we honor Danny’s memory isn’t that he’s a martyred journalist. It’s that he was a great journalist. Let me show you what I mean. Here’s something Danny wrote in February 2001, almost exactly a year before his death, from the site of an earthquake disaster in the Indian town of Anjar. What is India’s earthquake zone really like? It smells. It reeks. You can’t imagine the odor of several hundred bodies decaying for five days as search teams pick away at slabs of crumbled buildings in this town. Even if you’ve never smelled it before, the brain knows what it is, and orders you to get away. After a day, the nose gets stuffed up in self-defense. But the brain has registered the scent, and picks it up in innocent places: lip balm, sweet candy, stale breath, an airplane seat. What stands out for me in this passage is that it shows that Danny was a writer who observed with all his senses. He saw. He listened. He smelled. He bore down. He reflected. He understood that what the reader had to know about Anjar wasn’t a collection of statistics; it was the visceral reality of a massive human tragedy. And he was able to express all this in language that was compact, unadorned, compelling and deeply true. George Orwell wrote, “To see what is in front of one’s nose needs a constant struggle.” Danny saw what was in front of his nose. We each have our obligations to see what’s in front of one’s nose, whether we’re reporters, columnists, or anything else. This is the essence of intellectual integrity. Not to look around, or beyond, or away from the facts, but to look straight at them, to recognize and call them for what they are, nothing more or less. To see things as they are before we re-interpret them into what we’d like them to be. To believe in an epistemology that can distinguish between truth and falsity, facts and opinions, evidence and wishes. To defend habits of mind and institutions of society, above all a free press, which preserve that epistemology. To hold fast to a set of intellectual standards and moral convictions that won’t waver amid changes of political fashion or tides of unfavorable opinion. To speak the truth irrespective of what it means for our popularity or influence. 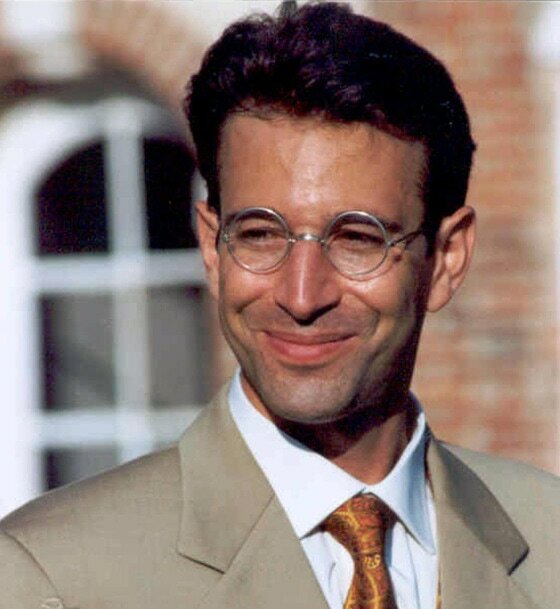 The legacy of Danny Pearl is that he died for this. We are being asked to do much less. We have no excuse not to do it.